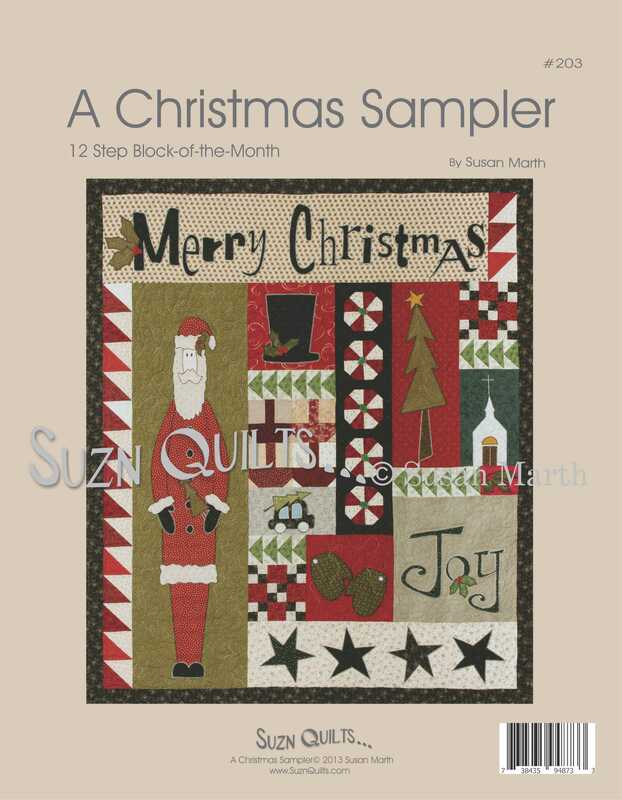 June | 2013 | Quilting my way through life! Do you sew for Charities? Once in a while I slow down enough to realize I should sew a quilt for someone in need. There are so many good causes to sew for. 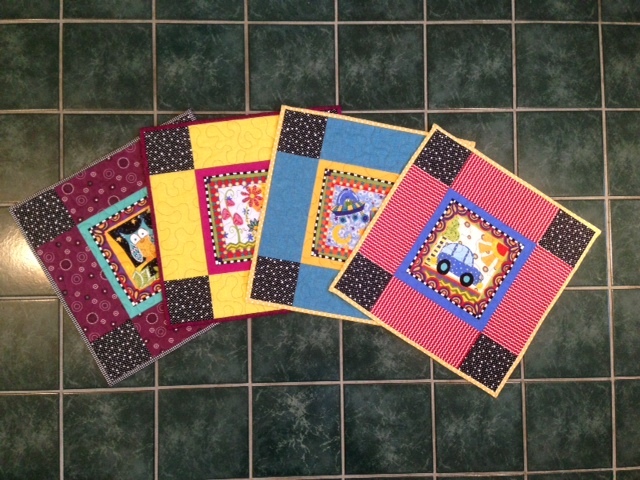 Our guild has a regular list for charities and what size quilts they have a need for. but the reason that I bought it had expired and I no longer “needed” it. When I examined it, I determined that the four individual squares that made up the panel would make very cute preemie quilt centers. Last night I was in between projects and I decided to cut those cute panel squares apart and start to work. My daughter, Chloe, was home and not doing much, so I asked her if she wanted to join the fun. They went together quickly and turned out so cute (if I must say so myself!). I didn’t go to sleep until the last stitch of the last binding was complete. They will go to our next guild meeting and from there to one of the St. Louis children’s hospitals where hopefully each one will give a preemie’s parent a little comfort knowing their tiny baby is covered in a quilt we made with love! That’s all you need to make a quilt! 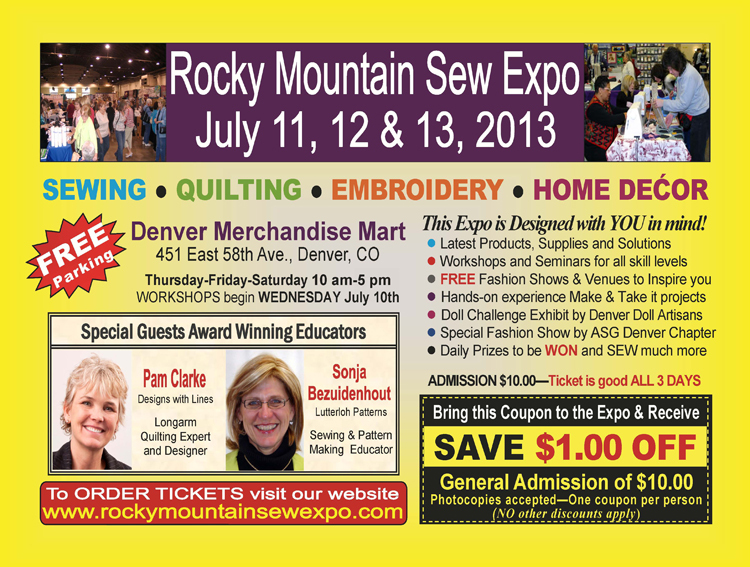 Looking at the calendar, I see it’s just two weeks until the Rocky Mountain Sew Expo! This week I’ve spent a lot of time configuring my booth. I will have a double booth, in a corner at the end of a hallway. 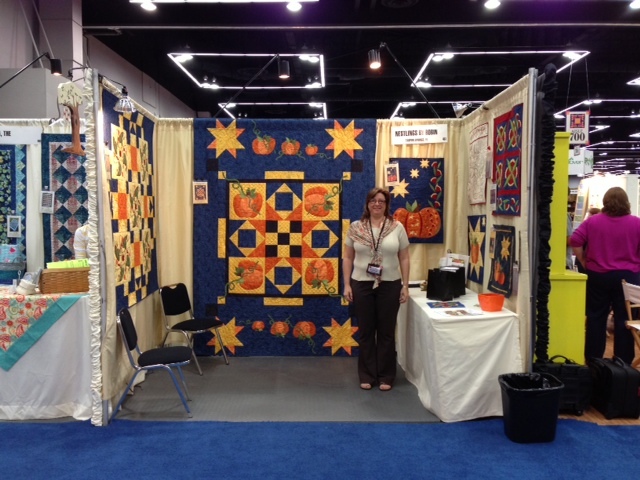 I was told my booth space wall will be able to spill out the width of that 10 foot hallway, so I’m going to be able to pack even more of my quilt samples to display! I hope you can come out and see us there! If you’re thinking about taking a class, there are still spots open in my Cobblestone Courtyard quilt-as-you-go class. All you need is a jelly roll and sewing machine with a walking foot! Your kit fee includes your backing and batting that I will provide already basted for you so you can get right to sewing when we start the class. Have a Christmas jelly roll? When you start with a jelly roll, most of the cutting is done for you. Print the above coupon & bring it with you to save on show admission. 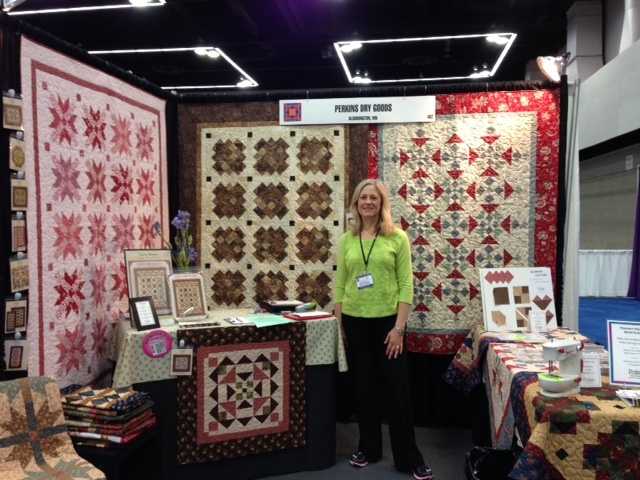 I’ve finally made time to show you a bit of Spring International Quilt Market in Portland, Oregon last month. This is Chloe & me in our booth. Celine of Perkins Dry goods. and Robin of Nestlings by Robin. Portland is beautiful. 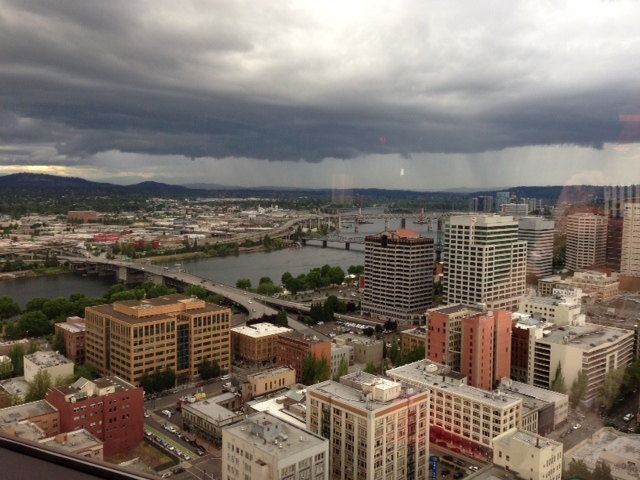 This is a view from the Portland City Grill where we were having dinner one evening after market. 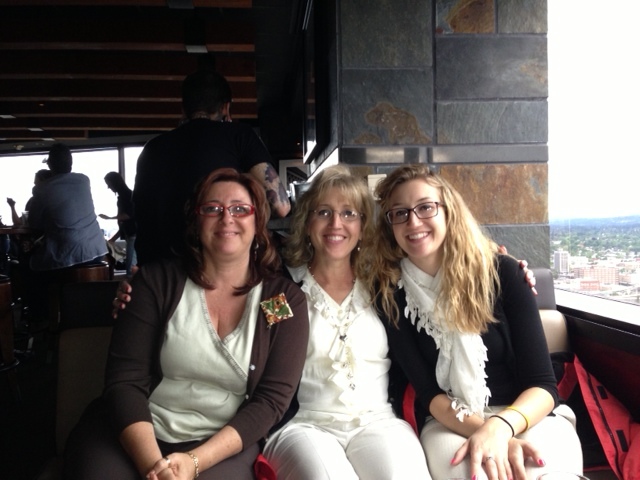 Here is Robin with Chloe and me. Monday after market closed and we stayed to do a bit of sight-seeing. 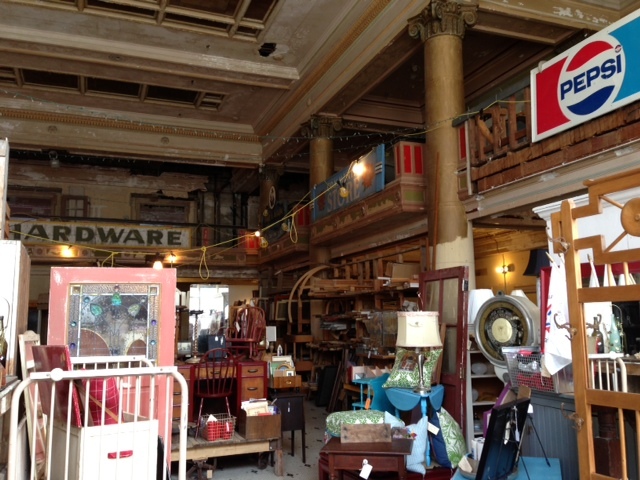 then did some antiquing and vintage shopping. I bought a few things for fall market that I could pack into our suitcases. I’ll show you those another day. Good thing we sold most all the patterns & books we brought! 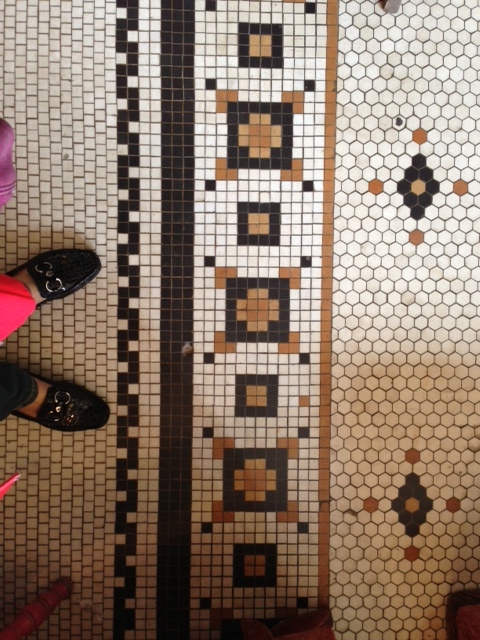 This is a cool old tile floor in the huge antique store that appeared to be a hotel among other things in its previous lives. 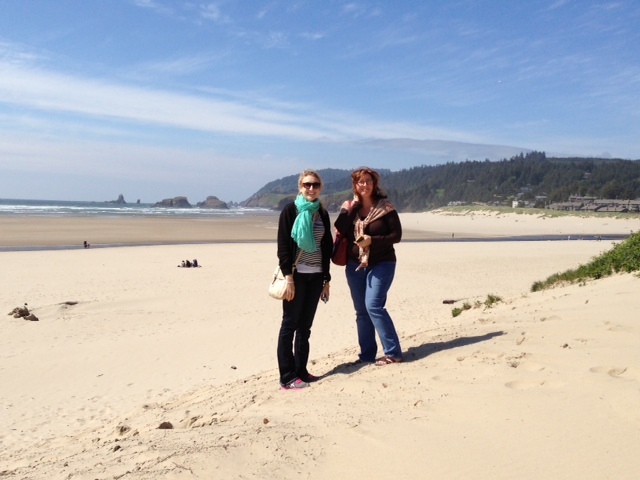 Then we ventured down the coast to the beach. 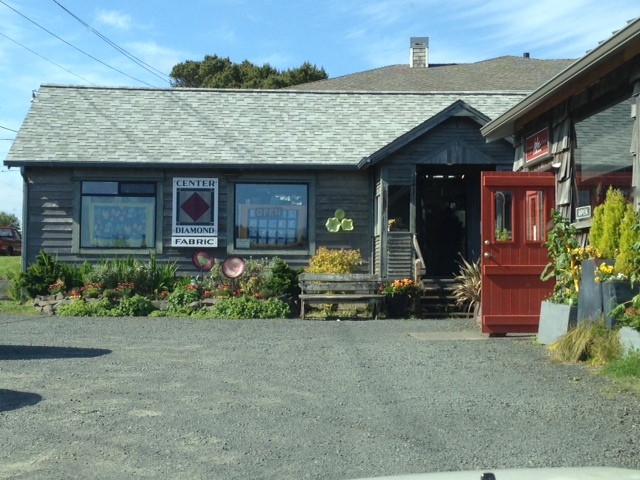 We shopped for souvenirs and found the quilt shop that I remembered from a previous visit to Oregon with my brother, David. 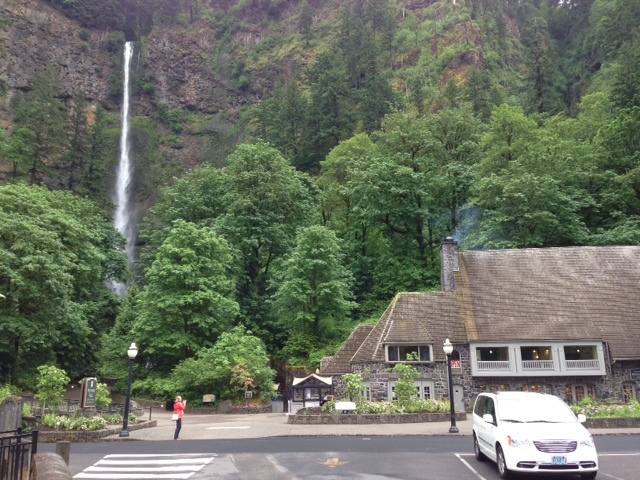 We had a beautiful trip back to Portland through two national forests. 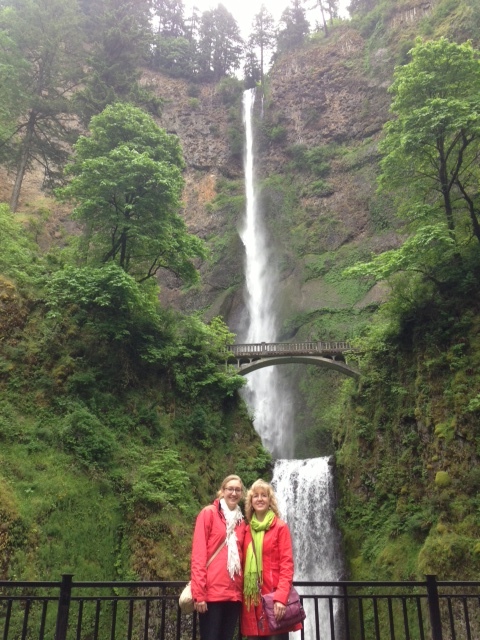 The next morning we got up early and headed to Multnoma Falls before our flight. I love how the smoke was wafting out of the gift shop. It reminded me of the story of Hansel & Gretel! More than once Chloe thanked me for making her pack a jacket! 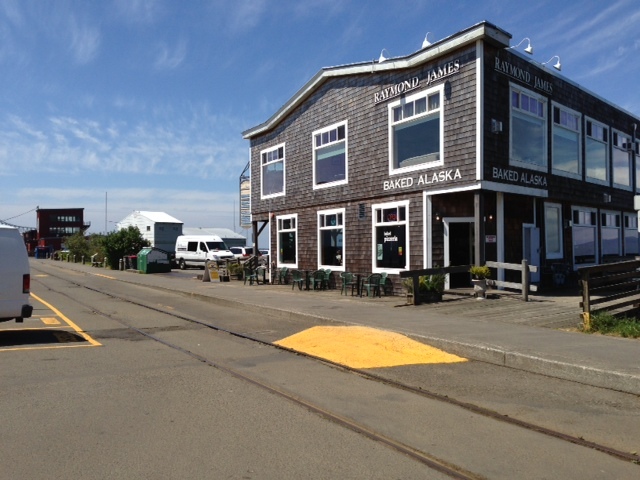 I hope you enjoyed seeing a bit of our travels. If you get the opportunity to visit, I highly recommend it. 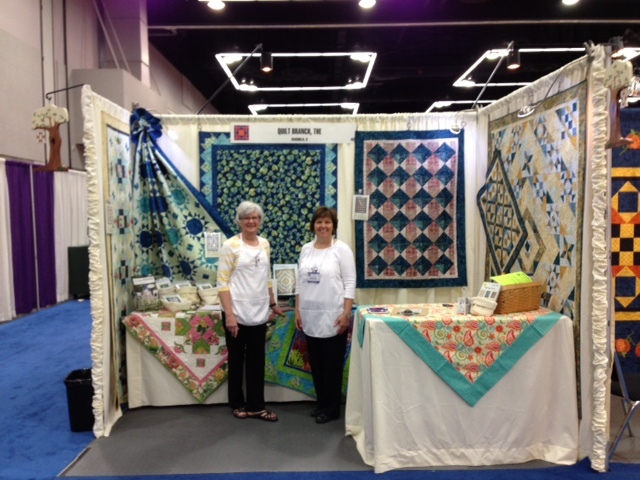 Come see Suzn Quilts at Rocky Mountain Sew Expo in 3 weeks! It seems every time I turn around I have 6 more things to do. I know, I should quit turning around. So since I’ve been so busy, I’ve decided I needed to do one more thing this summer. 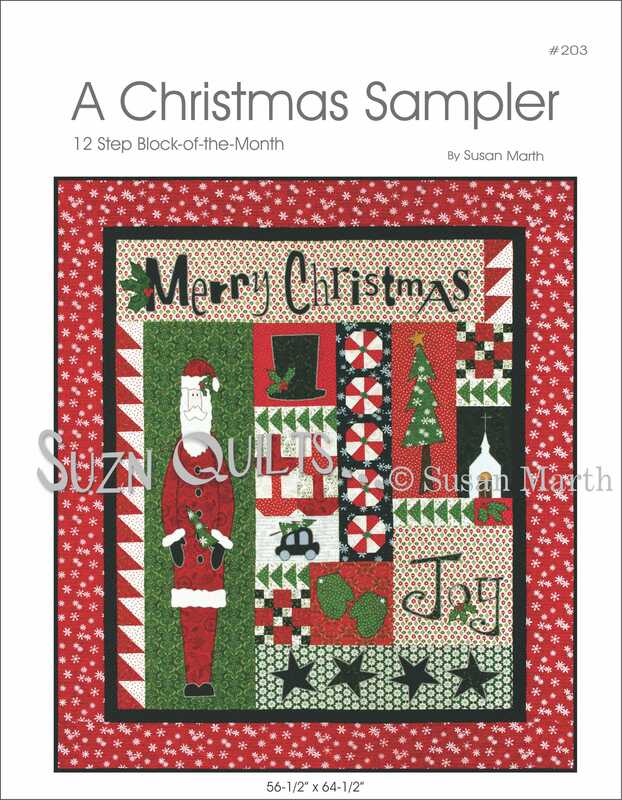 Suzn Quilts Patterns will be there! Actually my youngest daughter kept asking if we were going on a family vacation this summer. With our two oldest in college and working too we could not commit to a family vacation this summer like we usually do. and their work schedules would not allow those firm commitments. of course Clare would want to go somewhere too! print out this coupon and bring it with you! You will save on admission. but there are classes starting July 10. I will be teaching my new Cobblestone Courtyard pattern. made with one complete jelly roll of 40, 2-1/2″ strips. 9a.m. to 1 p.m. on Wednesday. I decided to do that part of the prep work for you. This will also help you to get more done in class. Click here and it will take you to class supply list & registration. You’ll need a jelly roll & general sewing supplies including a walking foot. 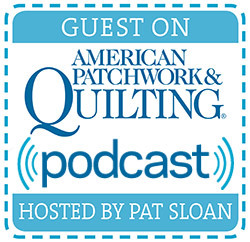 but you’ll see that on the Rocky Mountain Sew Expo website. Today’s new pattern is Cobblestone Courtyard. 1/2 yard of binding fabric plus the backing & batting. I’m always challenged to create ways to use those clever pre-cuts. but who doesn’t have one of those luscious jelly rolls sitting in their sewing room that was just too tempting to pass up? 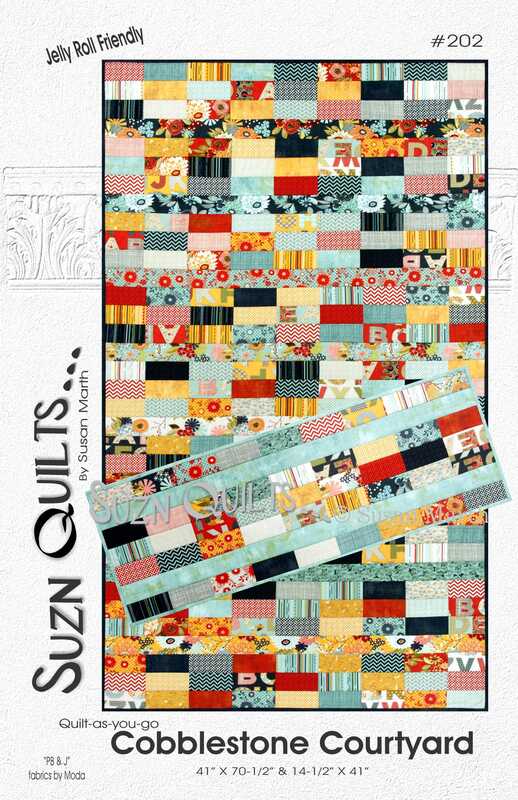 if you make it with that precious jelly roll, you’ll be able to display this quilt anywhere and be able to enjoy it forever! Another fun tidbit about using a jelly roll is that most of the cutting is done for you. 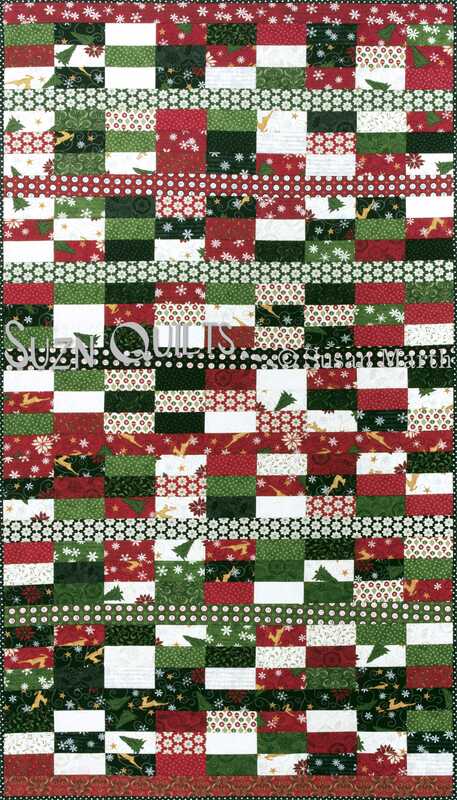 You truly can make this quilt in 1 day including the hand work on the binding. The jelly roll that I bought for this quilt is the new PB&J collection. It’s not too bright and not too dark either. Below is another version, with guess what fabrics??? It coordinated with my market booth. You can purchase the pattern on my website. 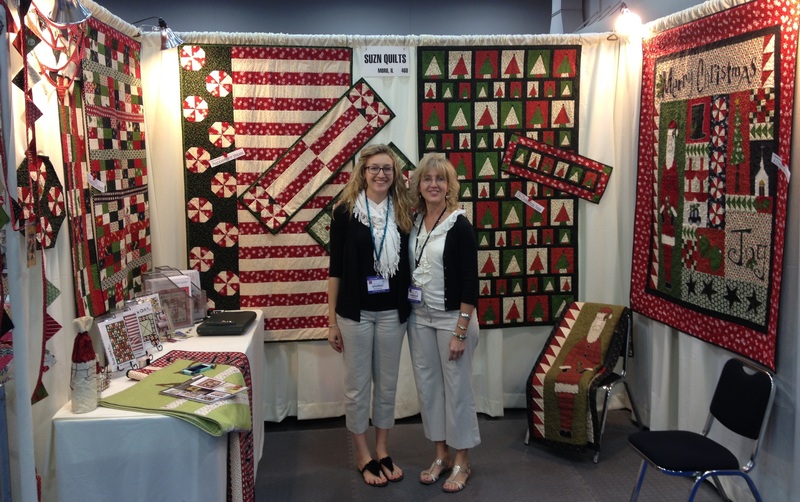 at the Rocky Mountain Sew Expo. Think about those jelly rolls that you might have stacked up in your sewing room and come join the class. My new book is next. Yes, another post & another new pattern! 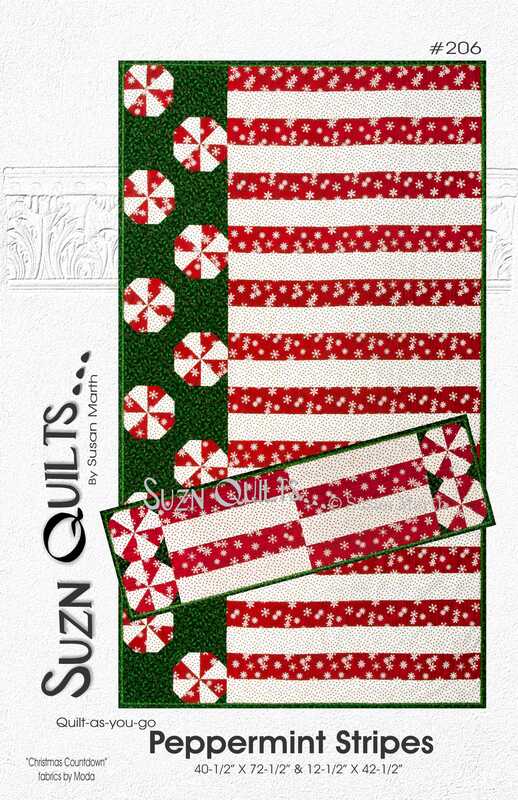 Today’s new pattern is Peppermint Stripes. I’m a creature of habit, I know already! It is however the first time that I’ve added a flange to a quilt. I added the flange (piping without the cording) of green before adding the binding. This is because I wanted to use black binding, but I didn’t want the black binding to fade into the black fabric of the quilt. I know, not that clever. then my new favorite book!